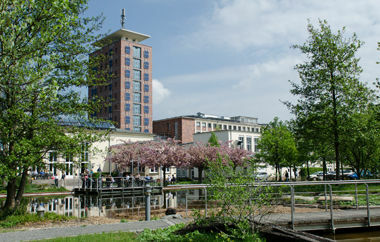 The Helmholtz Centre for Environmental Research (UFZ) is a world leading centre for environmental research. Since its foundation in 1991, UFZ has demonstrated how humankind and the environment can both benefit from the sustainable use of natural resources. UFZ’s more than 1,000 employees conduct cutting-edge research that is contributing towards overcoming major environmental concerns. After the reunification of Germany, in the early 90s, the region around Leipzig, Halle and Bitterfeld was heavily contaminated and natural resources had been overexploited. Therefore, the German Federal Ministry of Education and Research together with the German Science Council called for the establishment of a scientific center with the mission of conducting an extensive research on the ecology of concentrated industrial areas of the new German states. UFZ was the first research institution in the Federal Republic of Germany that was exclusively addressing environmental issues. From regional to global focus – Since new millennium, UFZ’s strategic focus shifted from land remediation in Eastern Germany to more global issues, such as environmental problems, unsustainable usage of land resources, biodiversity losses along with demographic and migration challenges and food and energy shortages. With its research on the environment, UFZ has a unique portfolio, addressing global challenges in line with the Sustainable Development Goals of the United Nations. Integrated research with a synthesis approach – To cope with the challenges of an integrated research and synthesis approach, UFZ’s structure is divided into six thematic areas: (1) Ecosystems of the future, (2) Water resources and environment, (3) Chemicals in the environment, (4) Environmental engineering and biotechnology, (5) Smart models and monitoring, (6) Environment and Society. They are further divided into 37 methodically organized departments, where among 1,100 employees also 250 PhD students bring their fresh view on the environmental research. Valuable expertise for stakeholders and decision-makers – UFZ-scientists make their expertise available in support of global institutions, such as the Intergovernmental Panel on Climate Change (IPCC), Intergovernmental Science-Policy Platform on Biodiversity and Ecosystem Services (IPBES) as well as the Bio-economy Council or the Office of Technology Assessment at the German Bundestag. Support for young researchers – UFZ is a part of the Helmholtz Association, where it pools its main expertise on the terrestrial environment including soil, surface and groundwater. Overall, in Germany there are 18 scientific-technical centers alongside the bio-medical focused institutions, united under the banner of Helmholtz, Germany’s largest scientific organization gathering 38,000 excellent professionals. One of the main goals of the Helmholtz Association is to support the new generations of researchers. In line with this aim, the “Helmholtz Interdisciplinary Graduate School for Environmental Research HIGRADE” was established, to support the qualification of young internationally competitive researchers, working in the field of environmental sciences. Young researchers gain a deep insight into the field of integrative environmental research along with competences for political and managerial career paths.